They are mine dumps. Black formations that draw the eye to their shaping. Process laid bare in massive movements of processed rock. In the valley, the earth blackened, seemingly oily at a distance, lie a series of mining buildings. The gash in the earth that is the valley is so deep that at first you can’t fully appreciate the at least two kilometres it covers. Silos, long sheds, and a medley of large con-joined buildings. Behind me stands the town, planned and leafy. Its silos of concrete residentital blocks against the morning blue. Beside the birch backed road is a wrecked car. A couple of men stand smoking. I turn again to the complex, and there again is the thick plume of smoke that seems to perpetually crawl its way across the sky. Before and beyond us is a simply gargantuan scene. A scene of processing. 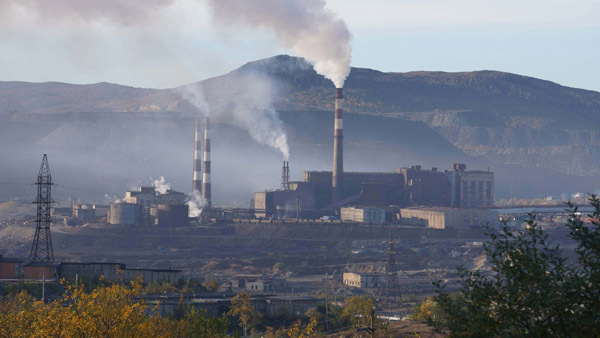 One division of the extensive Russian concern called Norilsk Nickel. And high on this vista of an epic industrial scale, as if advertising this scenario of the industrial foundations of 20th centruy settlement of the Kola region as part of Soviet development, stand what seem to be a gigantic pair of cyrillic letters. Artistic monuments to achievement, to a braver and better future, they cannot surely be. Enough of allusion. This is mining and these are the headgear it seems. Their casings making the means to drop miners down under the surface and draw forth the nickel ore that is wheeled upwards and rolls onwards into the enormous smelter. This is what marks the town out from its partner Nikel not far away. 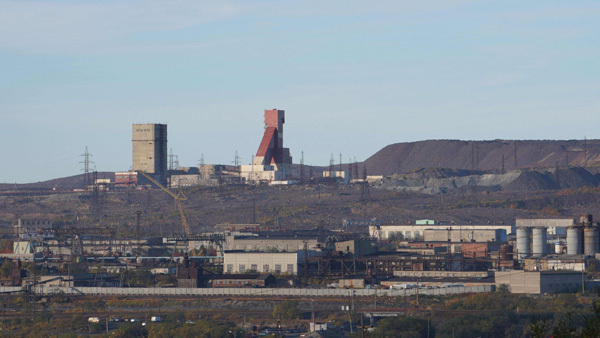 Zapolyarny is both a mine and a site of processing. Perhaps it will have a longer productive life than Nikel whose population is shrinking and whose future as a major national smelting site of is in question. We are not allowed any closer to the plant this is a secure installation, a part of a wider set of massive mines that have left their mark on the earth.